Thus, while yet a child, without discipline or the friendly instruction that wisdom might have lent, he was launched on the tossing tide of commercial life. His Hercules was immediately published and made a most decided hit—a palpable hit. Paris wanted more, and Philipon wished to supply the demand. The new artist’s pictures in the Journal pour Rire boomed the circulation, and more illustrations were in demand. Philipon suggested that the four hours a day at school was unnecessary—Gustave knew more already than the teachers. 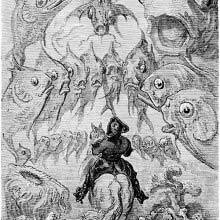 Illustration by G. Doré for Don Quixote. Gustave agreed with him, and his pay was doubled. More work rushed in, and Gustave illustrated serial after serial with ease and surety, giving to every picture a wildness and weirdness and awful comicality. The work was unlike anything ever before seen in Paris—everyone was saying, “What next!” and to add to the interest Philipon, from time to time, wrote articles for various publications concerning “the child illustrator” and “the artistic prodigy of the Journal pour Rire .” With such an entree into life, how was it possible that he should ever become a master? His advantages were his disadvantages, and all of his faults sprang naturally as a result of his marvellous genius. He was the victim of facility. Everything in this world happens because something else has happened before. Had the thing that happened first been different the thing that followed would not be what it is. 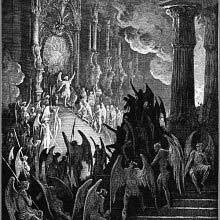 Had Gustave Dore entered the art world of Paris in the conventional way, the master might have toned down his exuberance, taught him reserve, and gradually led him along until his tastes were formed and character developed. 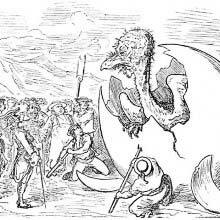 And then, when he had found his gait and come to know his strength, the name of Paul Gustave Doré might have stood out alone as a bright star in the firmament—the one truly great modern. Or, on the other hand, would the ossified discipline and set rules of a school have shamed him into smirking mediocrity and reduced his native genius to neutral salts? Who dares say what would have occurred had not this happened and that first taken place?